Artist Heather Patterson inside sound sculpture. One of Boston’s hidden artistic enclaves is the The Distillery that’s filled with creative businesses, artisans and businesses. There’s a cutting edge vibe that’s refreshing and inspiring. On a recent trip I was fortunate to meet some of the artists that have their studios within this converted rum distillery building. It was a surprise to run into artist Heather Patterson who was checking out this Sound Sculpture by Derek Hoffend. Heather was one of four artists that I collaborated with for the Synergies: New Gallery Artist Expo earlier this year at the So. Shore Art Center. Heather-you make a great model… I’m just saying. Derek Hoffend Sound Sculpture artist. 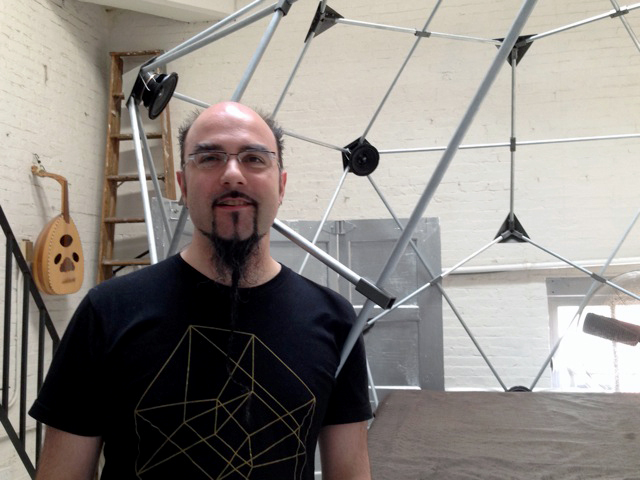 Derek’s sculpture’s have a zen-like effect in that the sounds are soothing and meditative and the vibrations reach into the core of your physical being. Definitely recommended to experience his creations in person. 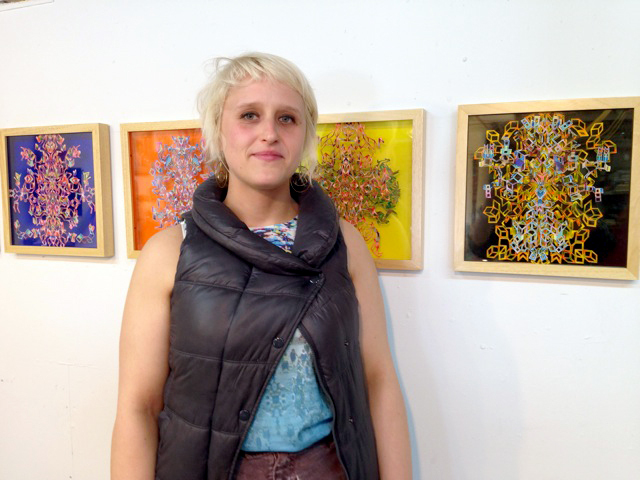 Vanessa Irzyk has her studio in The Distillery and her work is vibrant and contemporary. 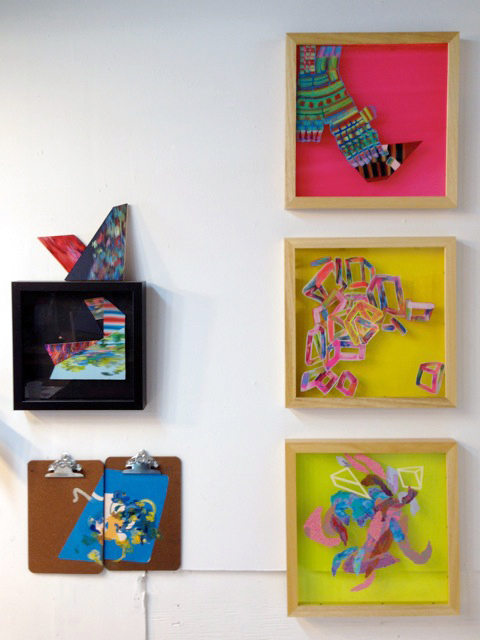 She has developed a technique of cutting paper and sandwiching the designs behind plexiglass. 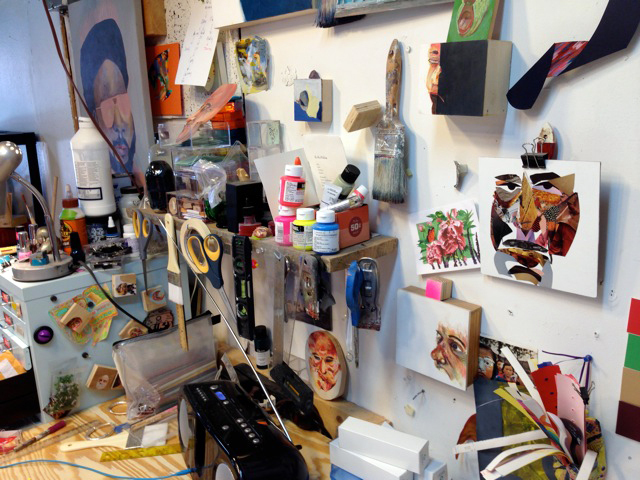 Creativity at work… Vanessa’s work space is a collage of everything that goes onto her artwork. This is where it all happens. Here are a few of Vanessa’s finished pieces. Upbeat and fun, free and yet very intricate. Finding inspiration locally in Boston at the Distillery where this space is charged with new ideas and artists who are ready to share their ideas and techniques. It’s definitely worth the time to venture to their Open Studios or visit the Main Gallery. The Distillery is located at 516 East Second Street in South Boston, MA 02127. Hours are from 9 am to 5 pm-Monday thru Saturday. You are currently reading The Boston Distillery at donna ingemanson studio.